On July 16th, 2011, the Napa Valley spa town, Calistoga, will celebrate the 125th anniversary of its founding with a one-day blast of food, song, awards and a raft of activities for all members of the family . The town started, and was named, in an unusual way: In 1861, a wealthy San Francisco millionaire named Samuel Brannan bought 2000 acres after experiencing the natural hot springs near the current Indian Springs Resort. He wanted to build a spa on the property similar to the hot springs resorts in Saratoga, New York. One evening, after a few too many drinks, Mr. Brannan announced to a group of supporters that he was going to build “the Calistoga of Sarafornia” instead of “the Saratoga of California,” and the new, and odd-sounding spoonerism “Calistoga” stuck. A village was born. The spa opened a year later and the railway connection to the rest of the state opened six years later in 1868. The town was incorporated in 1885, and it has been a spa destination ever since. Even today it is a popular destination for a Napa vacation. The celebration will include an all-day farmer’s market, presentations from some of the local wineries, a beer garden with local delicacies (barbequed oysters, taco trucks, crepes) and plenty of fun things to do for the kids, including a giant slide, bouncy castles a climbing wall and a dunk tank. Festivities will commence at 11am with a dedication of the 1887 IOOF building as a state historical landmark. The day will be accompanied by live music from Robbie Allen and the Outer Edge (surf tunes), the CT Cruisers (blues), and David Chapman & Friends (oldies). On July 16th (only), the Calistoga post office will be stamping mail with a special commemoration of the anniversary, and merchandise with the logo of the celebration will be on sale. 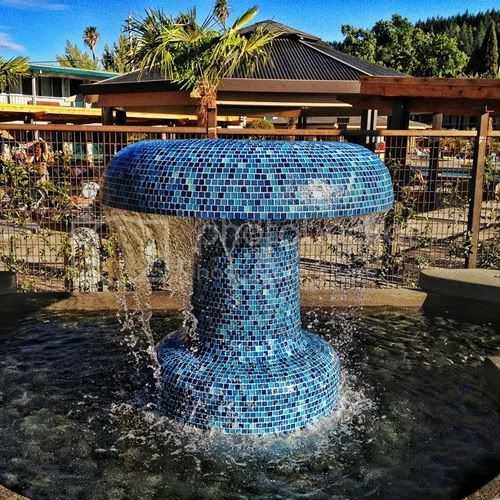 Photo of Calistoga Spa Fountain by septillion via flickr (Creative Commons).